This pilgrim way to Santiago is an important route for pilgrims from the south of Germany and eastern European countries. The trail starts in Waldshut in Germany, passes through Basel in Switzerland and continues to Vézelay where it connects to the main trail, the Via Lemovicensis or GR654. Peculiar detail is that it would be faster to walk to Le Puy-en-Velay where the Via Podiensis starts. In fact, this option is available. 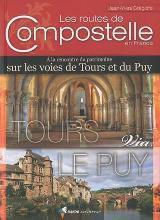 In Gy the Way forks: one leg to Vézelay, the other to Le Puy. Visit Traildino's overview page for the Way of Saint James / Camino de Santiago. Overview of Ways from Black Forest to Burgundy. Introduction to this Way between Switzerland, Germany and France. Peter Robins' ultimate reference website "The Walking Pilgrim".